Navarre Beach’s gulf side artificial snorkel reef will triple in size by as early as September. 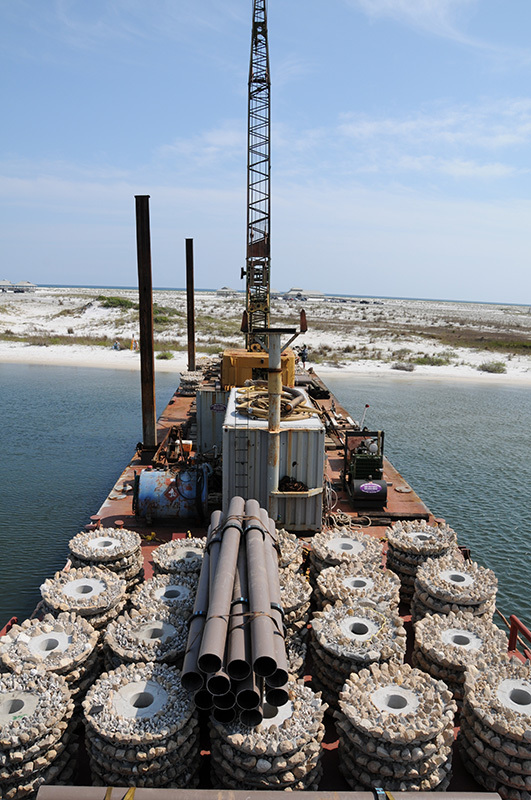 Santa Rosa County Commissioners selected Walter Marine July 27 to place 60 new artificial reef structures on both sides of the existing reef as part of a $1.4 million National Resource Damage Assessment (NRDA) grant. The $210,900 cost for installation of the modules is covered entirely by the grant. Mike Sandler of the Navarre Beach Marine Sanctuary, who is also chairman of the Navarre Beach Area Chamber of Commerce, said he is happy the project is moving forward. “We are happy to finally get the contract awarded. This will be a really huge event. It is going to be tremendous for the ecosystem and tremendous for our beach,” he said. Walter Marine owner David Walter helped install the existing reef modules, which are his patented design. He has been in the reef building business since 1986, when someone approached him about utilizing a boat for carrying reef materials. The modules are disks of concrete on fiberglass supports. These supports are driven into the sand to act as a “skeleton” on which the reef can grow. The concrete is embedded with limestone. Walter explained that limestone has the proper pH for all marine life and is soft enough to allow animals to dig in. The module provides a surface area for marine plants and animals, like coral, to grow. The reef structure has also historically held up to storms, Walter said. He said he is especially fond of the Navarre reef. He also said the reef can and has been a boost to tourism. Sandler agreed, but he said it also serves an ecological purpose. “I can’t imagine how much more popular this is going to be. With it tripling in size, that means tripling the wildlife because you are increasing the habitat… It is probably going to increase the fish populations around our area. Important thing is those reefs provide a mechanism for little fish to get bigger because they are vulnerable as babies,” he said. The species on the reef include trigger fish, puffer fish, squirrel fish, dolphins, guppies, damsels, sea turtles, octopus, crabs and more. The reef was made possible by the efforts of the Navarre Beach Area Chamber of Commerce Foundation in partnership with Santa Rosa County after the foundation began exploring what it would take to bring an artificial reef to Navarre through grants. The remaining portion of the NRDA grant, which is administered by the National Oceanic and Atmospheric Administration, will be used to pay for another reef 1 mile out from shore. This dive reef will stretch 2 miles parallel to the beach starting at the Eglin Air Force Base Reservation line to the east and running west in front of the Navarre Beach Fishing Pier. The reef will be 1 mile wide and 60 feet below the surface. There will be between 500 and 700 modules for this reef, but they will be shaped differently than the snorkel reef modules. These will likely be pyramid or hexagonal in shape for the greater depth. Sandler said it is important to remember that the NRDA grant can only be used for the reef expansion project, and that it has a time limit for completion. He said he hopes the second portion of the project will go out for bid as soon as the first phase is underway.